Today is a fab day, albeit another belter of a hot one. For the best part of it the skies have been bright blue with varying amounts of clouds whizzing through, blown by this very welcome wind from the SSW. Happy Socks is surfing like a dream and the Tweedles are loving it. So am I. Hence the title – it is one of those days when you feel like you are grinning out loud. 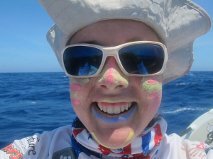 I found my favourite present of the journey so far the other day – coloured zinc suncreams. So today seemed like a good time to paint myself stripey. Guess who found the coloured zinc suncreams?! 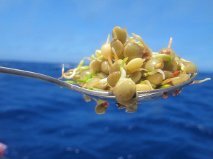 The other wonderful thing was the Boat Salad – my first crop of lentil sprouts. To munch on fresh food after all this time on dried stuff is just magic. Lee mentioned a tropical storm in his last forecast – Leepi, (who I think is just crying out to be nicknamed Loopy) – due to run itself out to the North of me in about 72 hours time. If it stays as predicted I should get some useful SSW winds – nothing too mad – though Lee says it’s track and timing are still a bit uncertain and that the front attached to it may stall near me and a new one will try forming, creating messy stuff. His shout is to stay tuned. So we are. Meanwhile, we surf and sing on. These are happy days. PS. The dorado was back today, iridescing round the boat as it flashed past, surfing down waves. As you can imagine, the Tweedles kept the boat between them. Susie Hewson: Excellent bit of poetry Susie! Any other offerings out there? Tari: Cannot believe you mentioned the S word… I won’t tell the Tweedles. They vary in size – the little ones are a few inches and the biggest are about 15 inches. They are my emergency rations – only to be eaten if I starve. And that won’t happen. Lesley: Thanks for your optimism! I won’t starve – I have plenty of food onboard. We always knew this would be a long one. Grab the reigns…and ride those white horses, Sarah. hi Sarah. The lentils look great- well done! no doubt they tasted delish- is horticulture another of your talents?? good to see you are heading in the right direction again.We like the sun cream too! Physical barrier SPF – my FAVE!! High marks from this esthetician!! I think I’ll have to try growing my own sprouts – those look fantastic!! Will you grow sprouts continually throughout your crossing? I hope you have many more days of *grinning out loud* ahead! Come on Loopy, send some favourable winds Sarah’s way. The Lentils look delicious and the stripy war paint made me grin out loud. Hi Sarah. Been watching your posts for over a year now, great to see you back on the ocean and enjoying the adventure. Thank you for the posts, they help me keep things in perspective whilst I sit on the M6 each morning! Best of luck with avoiding ‘Loopy’, I hope she/he gives you some useful winds! May the winds go with you, Sarah. Do you grow any other things on board? I really enjoy your descriptions of the passing wildlife. PS: Hi Karel, thought there would be only one Karel talking about weather! Good to see you going in the right direction at last. Are you taking your lunch [ fishes ] with you. Been plugging for you [ Come on Sarah come on, Come on. Come on Sarah come on ] with Aussie accent. Nice to see you are having happy days now – I wasn’t sure what a Dorado is so looked it up on Google – looks amazing with beautiful coloring. Dorado (or mahi-mahi as they are called some places or dolphin fish as they are called in other places) are one of the world’s most popular gamefish, and it’s no mystery why that is. They are spectacularly colored, fight hard and jump when hooked, and taste delicious. They are abundant in most tropical locales and because they are a fast-growing, short-lived fish they are hungry more often than not. They die of old age around 5-6 years and attain a maximum weight of around 90lbs. Enjoy your surfing and your solitude Sarah, blue sky!! We only get a glimse of blue sky in the afternoon if we are lucky! Here in Brittany we seem to be enveloped in grey cloud for months! Woo hoo! 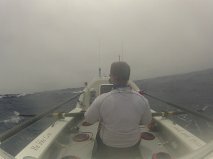 Saw the tracker and you are well on your way and almost surpass your furthest rowed point now! If it’s progressing just like today, maybe you will never need to get to stripy fish emergency ration. you are having the sunshine we are missing! Thank you so muhjch fortaking time out of your ‘holiday’ to speak to us – it was great to hear your report and we all wish you continued progress towards Canada and a little nearer home! Mike and all the gang at Rutland Sailability. Hope you dont have another storm. Have a good time Sara. Hello sarah how are you getting on roahing in your boats well I hope that theres no more storms. wal dun ser and haw didyoo grow yor seysalood. where did you go in japan? because that’s my faivourite country! Woo hoo Sarah! you ar doing well.how do you grow things on your boate.